Waxing has never really been my bag. Generally, things which unnecessarily induce pain I would usually shy away from, however, I put this aside to try a handy new product from Veet. 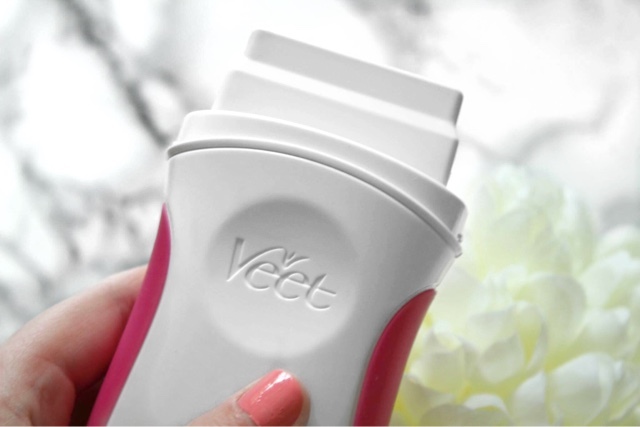 The Veet Natural Inspirations EasyWax Electrical Roll On Kit is a handheld self-heating waxing device. It comes with a base, which holds and heats the device to the right temperature. Once warmed up, you simply roll it over the area in question, place on a non woven wax strip… and then quietly pray that it will painlessly remove itself from your skin, so you don’t have to tear it back off yourself. Hey presto! Made with 90% ingredients from natural origin, the wax formula is really kind to skin. It contains pine tree and shea butter which both help to soothe and moisturise. A pinkish shade, the wax is very easy to roll it on your skin and build up when you need more of the formula. Typically, I left the device for about 30 minutes to heat up, but made sure to replace it back on the base while I was patting/wrenching off wax strips. There are 12 non-woven waxing strips included in the box. 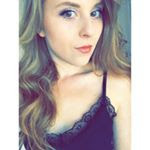 As a waxing novice, it is entirely possible that my placement of these was not quite right, but I did feel like you would easily get through these quite quickly – particularly if you have thicker, or more, unwanted hair. That said, you can purchase more if you do get through them. 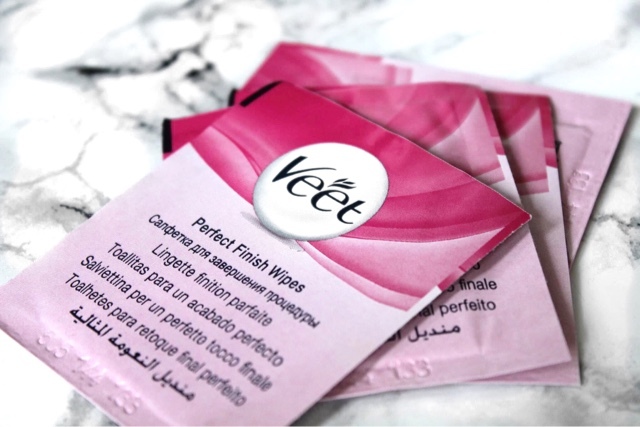 Also included for once you’ve whipped off the strips, are the Veet Perfect Finish wipes. These basically help to clear up any wazy remnants on your skin, as the oil helps to displace it. While I appreciate it is their purpose to be, I found the wipes to be a bit too greasy. I also couldn’t get all of the extra bits of wax off, so they weren’t a great deal of use to me. So the overall verdict? It is definitely a useful tool. 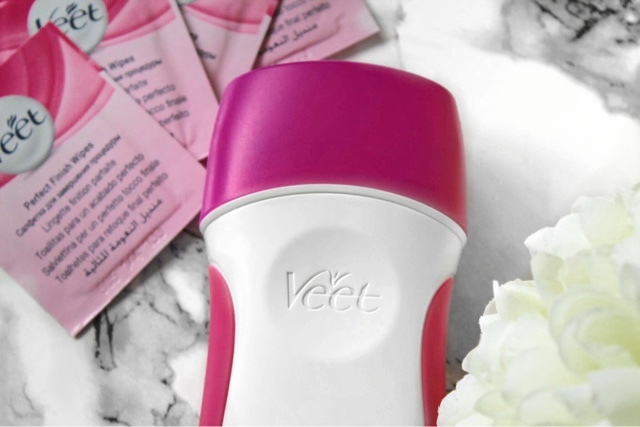 The roll on device definitely makes more fuss free waxing, so it’s perfect if you’re using it on the go. The drawback for me, however, was that I found it quite difficult to get consistent results. I varied the thickness of the wax I was applying, but found most times pulling the strips off, only a few hairs came with it! While I didn’t get the best first impression with this, I think it is fair to say this is likely in part to the fact that waxing is just not my forte. If you’re looking to try this out it retails for £15.74 at Boots stores, with additional refills priced at just over £10. *Product received as part of a review panel.